Posted by Kim Ciuffreda on Monday, August 8th, 2016 at 2:11pm. 1. Zigzag appeal. 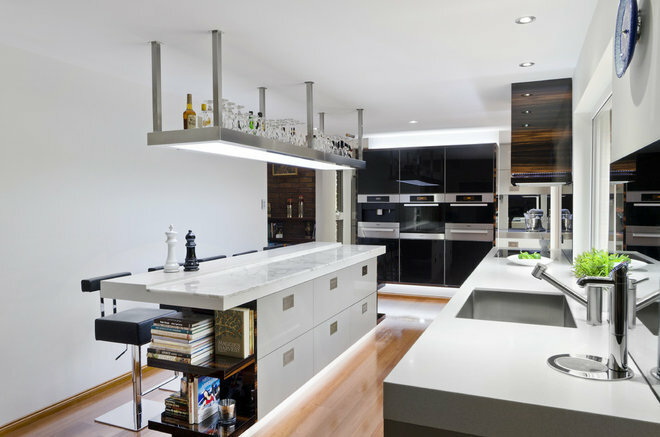 It’s not unusual to see a series of floating shelves in an office, or a single long shelf in today’s kitchens that have forgone upper cabinets. Far less common is a single floating shelf with dips and peaks like this one. Though it serves the same function as the straight shelves we’re accustomed to, its dynamic lines gives it a decidedly edgier profile and allow it to take up more space on the wall. Plus, its command of the recess earns it the bona fide title of feature wall. 2. Reclaimed radiance. 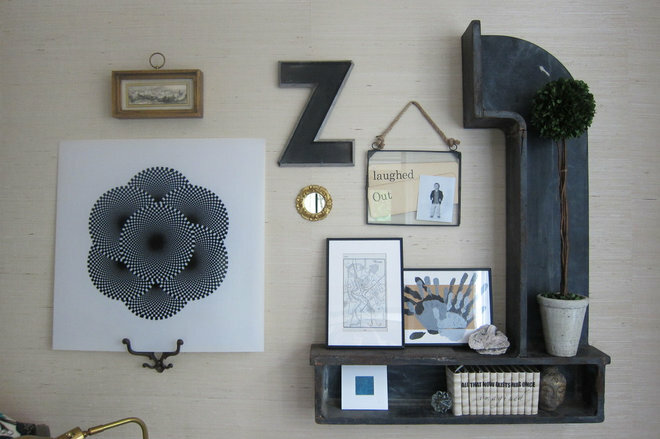 Toronto-based Rad Design created these reclaimed-wood and steel-pipe shelves to perfectly fit the wall space. Pipe arms extend to display a few cameras from the collection of one of the homeowners. 3. Fabulous feature wall. 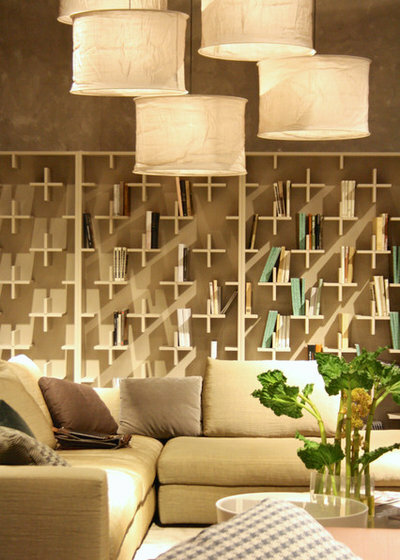 These next two funky wall treatments scarcely resemble regular bookshelves at all. 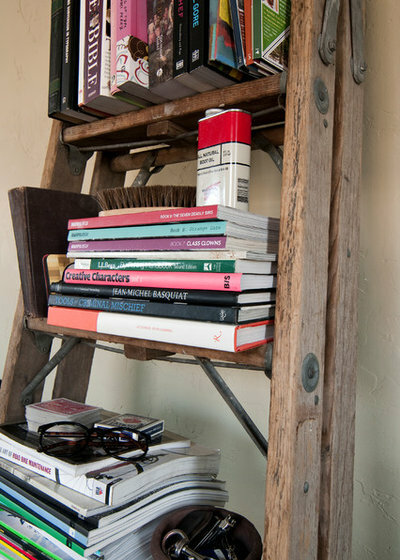 The little crosses in this array are positioned close enough so that tall books can lean out onto an adjacent shelf, which acts like a built-in bookend. The overall effect is akin to 3-D wallpaper, complete with checkerboard shadows across the empty shelves and diagonally striped shadows across the occupied sections. 4. Stylishly slanted. The crisscrossed shelves here are out of the ordinary to be sure, but with a little imagination you can see how their diamond pattern mimics treillage, the art of covering walls with latticework, popularized by famed decorator Elsie de Wolfe. 5. Step it up. A steep set of stairs often involves a narrow wall — often decorated with one small piece of art. 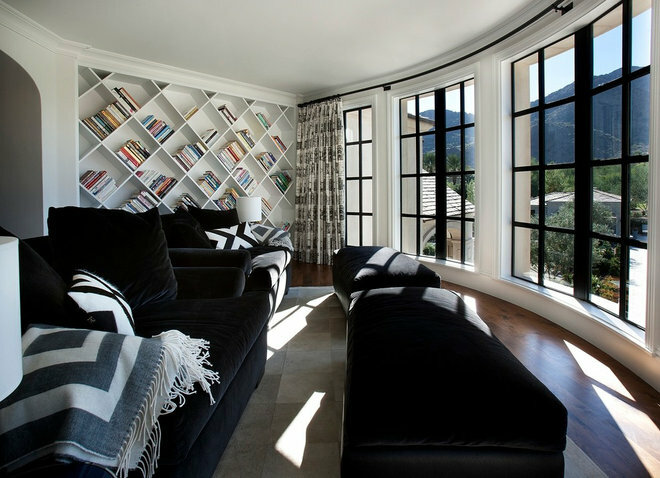 But why not rethink that wall and turn it into a bookshelf? 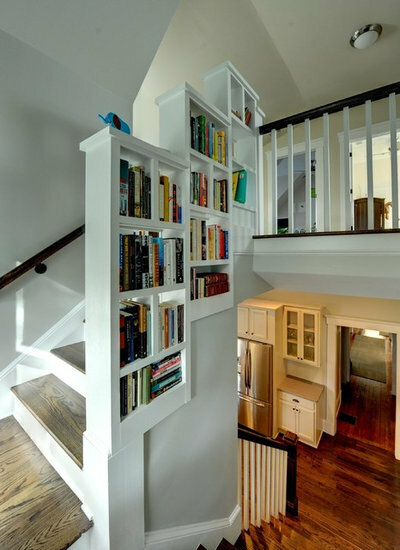 The creative solution adds an unexpected design element and makes it easy to grab some bedtime reading on your way upstairs at night. 6. Headboard highlight. 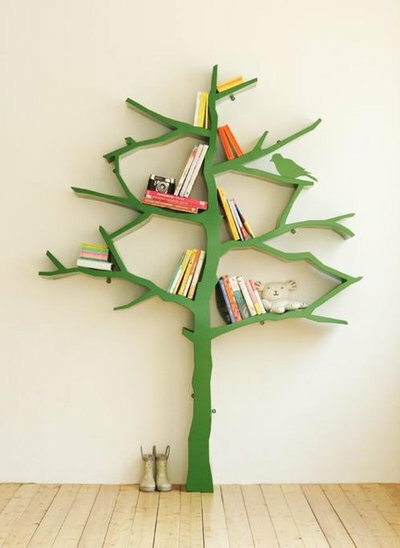 Speaking of bedtime reading, this custom tree-inspired bookshelf in Colorado is more than just clever storage. 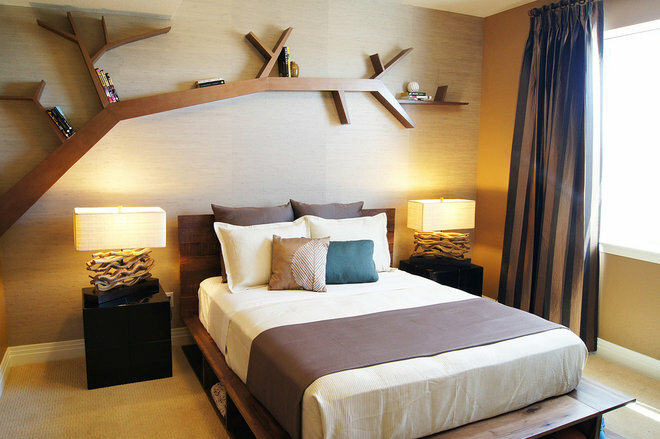 It creates a dramatic statement that entirely changes the scope and feel of the room. 7. A simpler approach.Sometimes a simple ladder propped against the wall will get the job done. For those with a no-fuss, “undecorated” style, this look is for you. If the ladder happens to be a little beat up, so much the better. 8. Boxy and beautiful. It’s hard to believe that any businesses still use wooden crates in 2016, but happily for us wineries do, as do some pick-your-own-produce farms. 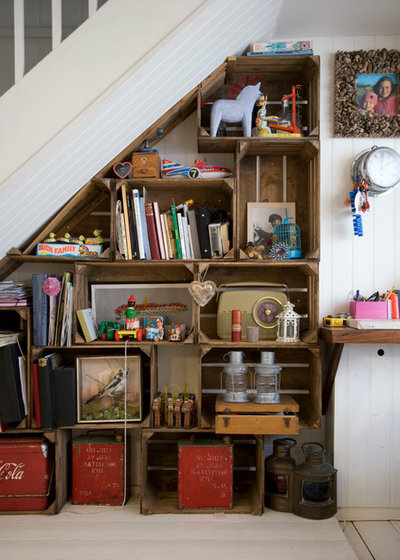 Get your rustic fix by collecting these humble heirlooms to use as storage for your treasures. Bonus: Their modularity makes them easy to fit into those awkward nooks beneath stairs or roof gables. 9. Industrial ingenuity. 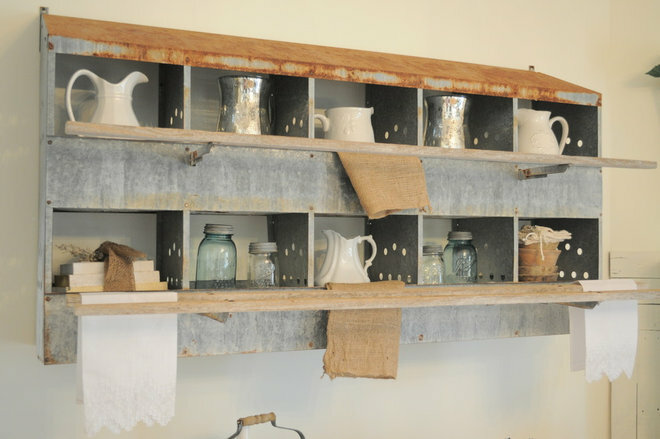 While we’re on the theme of repurposing utility items as home decor, let’s all ooh and ahh over this old factory-mold-turned-shelf. 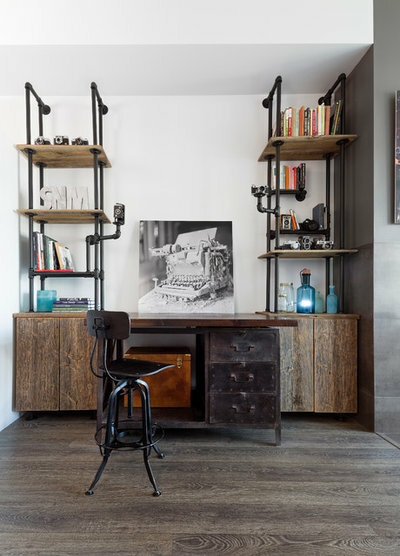 I’d argue that industrial pieces like this aren’t as easy to come by as domestic relics of bygone years, but if you get your hands on something totally unique, flex your creative muscles and find it a home within your home. There’s something comforting about being around items that have borne witness to human progress; many people find it puts them in touch with a world beyond their own. 10. A definite original. 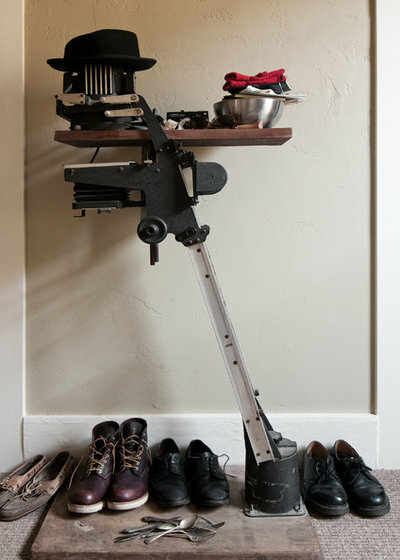 I couldn’t say exactly what we’re looking at here, but I’d hazard a guess that the homeowner is an engineer or technical type who could tell us what else this machine is good for besides being a pretty snazzy shelf. 11. The giving tree. This bookcase by GiveWink in Miami was designed for the nursery. Hand-sanded to create smooth edges, it can store up to 100 books. 12. Illuminated thinking. Here’s a new twist on the built-in shelf: It’s “built in” to the light fixture, for a terrific example of a necessary design feature — a ceiling-mounted light — doing double duty. Of course, if you’re considering using this idea in your own home, it’ll pay to either be tall or have a relatively low-hanging light. 13. 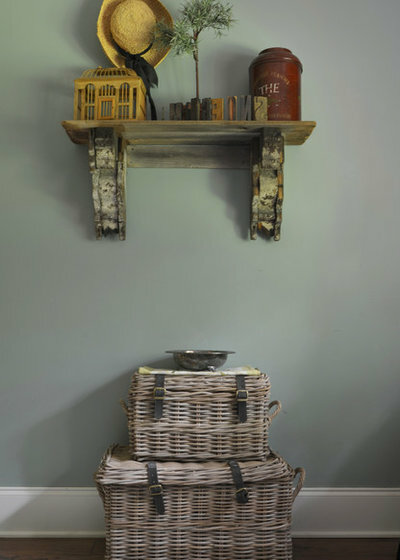 Rugged and repurposed.Here we see that it’s also possible to take an out-of-service architectural detail, like a pair of corbels, and turn it into a shelf. 14. Crowning achievement. 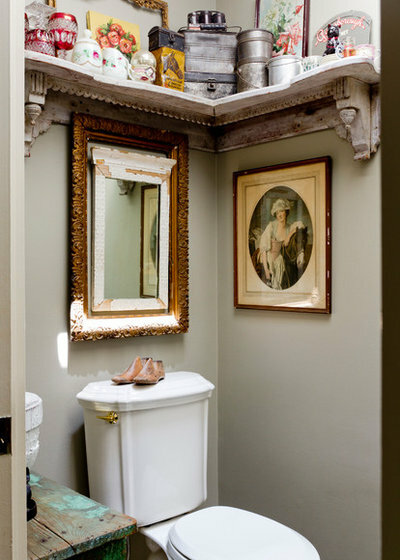 You could go even further and recruit an entire corner piece of elaborate crown molding for use as a decorative upper shelf in a powder room, as this homeowner did for her Victorian-inspired bath. The moulding sets the tone for the entire space, in fact. 15. Forgo those bulky cabinets.The kitchen is fertile ground for unique shelving since there’s simply so much that needs to be stored there. We’re seeing more and more people eschew upper cabinets in favor of long shelving, and while it may prove to be a trend that fades like any other, it still feels fresh and unexpected to see shelves running across kitchen windows. 16. Coming home to roost. Unless you’re an urban homesteader or a poultry farmer, you may not realize that what we’re looking at here is an old chicken nesting box where hens once laid their eggs. Instead of clucking birds, it now houses country jars and pitchers.